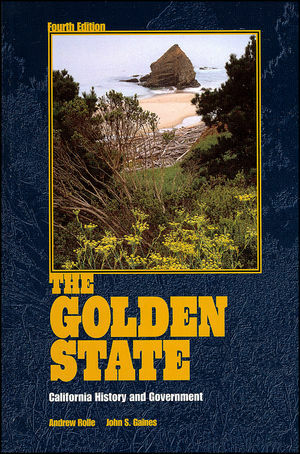 Thirty-five years after its initial publication, The Golden State remains a balanced, multicultural, and interpretative history, the ideal text for students of California history at the high school and community college level. With due attention to the many peoples who make California the most ethnically diverse state in the nation as well as the daunting environmental realities that challenge the resolve of all who call the Golden State home, the informative and enjoyable narrative features expanded coverage of such topics as women, water issues, ethnic relations, crime, sports, culture, and politics in the twentieth century. A crucial feature of this affordable, beautifully illustrated, and durable hardcover volume remains a chapter on state, county, and city government, detailing the responsibilities of state officers and the organization of the state legislature and court system. The elements of direct democracy-referendum, recall, and initiative-and the legislative process also are explained in direct yet lively fashion. Andrew Rolle has written over twenty books on California, the American West, Ethnics, and Psychohistory. One of these, The Immigrant Upraised, won the Commonwealth Award for nonfiction. Formerly Cleland Professor of History at Occidental College, Professor Rolle is now a Research Scholar at the Huntington Library. Harlan Davidson has also published his California, A History, Fifth Edition. John S. Gaines, Professor of American Studies and Education at King College, is a second generation California. He has taught history and government at the public school, community college, and four-year college levels. He holds degrees from Occidental College, California State University, Northridge, and the University of Southern California.